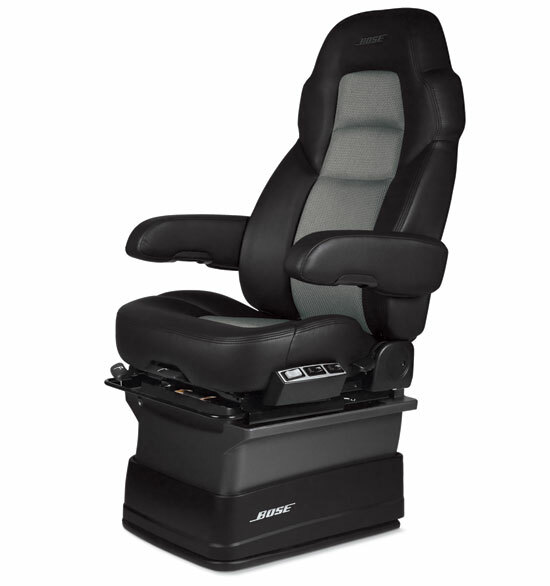 The Bose Ride System is a highly advanced technological replacement for those pathetic old-style truck seats that just bounce around. Even with the best conventional air-ride seats, over-the-road drivers experience constant road-induced, whole-body vibration. Research studies confirm that whole-body vibration reduces comfort, increases fatigue and causes stress to the body and spine. These factors can impact profits, increasing fleet operating costs and decreasing service levels. A high-powered linear electromagnetic actuator in a package small enough to fit under a truck seat. A regenerative amplifier powerful enough to support a 350 lb driver, yet so efficient it typically draws less energy than a 50-watt light bulb. Sensors and control algorithms working together to counteract road disturbances before they reach the driver. "Captain Mason," Arcot explained to the Air Inspector, "these seats may be a bit more active than one generally expects a seat to be..."
"You'll notice that my controls and the instruments are mounted on the arm of the chair really; that permits me to maintain complete control of the ship at all times, and still permits my chair to remain perpendicular to the forces. The gyroscopes in the base here cause the entire chair to remain stable if the ship rolls, but the chair can continue to revolve around this bearing here so that we will not be forced out of our seats."